1949 Born in April 1949. 1972 Graduated from the Leningrad Institute of Chemistry and Pharmaceutics. 1984–1986 First Secretary of the Krasnogvardeisky District CPSU Committee in the city of Leningrad. 1985 Graduated from the Academy of Social Sciences of the CPSU Central Committee. 1986–1989 Deputy Chair at the Executive Committee of the Leningrad City Council. 1989 Elected People’s Deputy of the USSR. As one of the youngest female MPs, headed the USSR Supreme Soviet Committee on Women, Families, Maternity and Childhood. 1991 Completed Senior Diplomatic Staff Course at the Diplomatic Academy of the Ministry of Foreign Affairs of the USSR, and joined the diplomatic corps, where she served until 1998 with the rank of Ambassador Extraordinary and Plenipotentiary. 1991–1994 Ambassador Extraordinary and Plenipotentiary of the USSR and the Russian Federation to the Republic of Malta. 1995–1997 Director of the Foreign Ministry Department for Liaisons with the Constituent Entities of the Federation, the Parliament, Public and Political Associations, member of the Foreign Ministry Collegium. 1997–1998 Ambassador Extraordinary and Plenipotentiary of Russia to Greece. 1998–2003 Deputy Prime Minister of the Russian Federation. 2003–2011 Appointed Presidential Plenipotentiary Envoy to the Northwestern Federal District in 2003, and elected the same year Governor of St Petersburg, Russia’s “northern capital”. 2011 On 31 August 2011, she took her seat on the Federation Council of the Federal Assembly of the Russian Federation as a representative of the executive authority of the city of St Petersburg. On 21 September 2011, she was unanimously elected Speaker of the Federation Council, and re-elected to this high office in 2014. Ms Matviyenko has been serving as a permanent member of the Security Council of the Russian Federation since September 2011. In November 2011, she was elected Chair of the Council of the Inter-Parliamentary Assembly of the Member Nations of the Commonwealth of Independent States (IPA CIS). Order for Service to the Motherland, 1st Class (2014). Valentina Matviyenko also holds a number of foreign decorations: the Grand Decoration of Honour with Sash for Services to the Republic of Austria (2001), the Order of Princess Olga of Ukraine, 3rd Class (2002), the Grand Cross of the Order of Honour of the Hellenic Republic (2007), the Grand Cross of the Order of the Lion of Finland (2009), Order of Legion of Honour of the French Republic (2009), Order for Great Love for Independent Turkmenistan (2009), Order of Friendship of the Peoples of the Republic of Belarus (2009), National Order of Merit of the Republic of Malta, 2nd Class (2013), Order of Friendship of the Republic of Kazakhstan, 2nd Class (2016). Valentina Matviyenko was also decorated with a number of medals. Has a son and a granddaughter. Leisure activities: literature, theatre, painting, music, sports (tennis, alpine skiing). 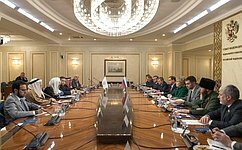 b) drafts the agenda for Federation Council sittings, submits it for review to the House Council and presents the reviewed draft to the Federation Council. af) issues instructions to Federation Council committees (as per Federation Council Resolution No. 38-SF dated 22 February 2012). ag) issues instructions to other Federation Council officials (as per Federation Council Resolution No. 79-SF dated 26 March 2003). 2. The Speaker of the Federation Council issues directives and instructions on matters within his or her authority. 3. The Federation Council may cancel a directive issued by the Speaker of the Federation Council of the Federal Assembly of the Russian Federation (hereinafter directive of Federation Council Speaker) that contravenes the laws of the Russian Federation or these Rules of Procedure. 4. The Speaker of the Federation Council, or the First Deputy Speaker of the Federation Council acting on the Speaker’s instructions, reports to the Federation Council on the House’s activities and draft programme of its legislative work in the manner set forth by a Federation Council decision, as discussed during Federation Council sittings. The Federation Council may adopt resolutions following a debate (as per Federation Council Resolutions No. 152-SF dated 26 May 2004 and No. 305-SF dated 19 September 2008). 6. 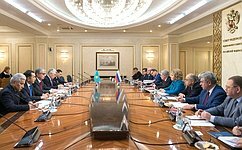 The Speaker of the Federation Council approves standards for financial, material, technical and other provisions for Federation Council members, as duly agreed with the Federation Council Committee on House Rules and Parliamentary Governance. (Part 6 was introduced as per Federation Council Resolution No. 223-SF dated 18 June 2008; as per Federation Council Resolution No. 568-SF dated 27 December 2011). The parties have discussed a wide range of bilateral and international issues.